Star Boxing put together an exciting seven bout card at the beautiful Mohegan Sun Resort and Casino in Uncasville, CT. 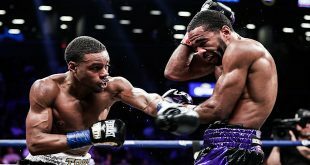 The card, which was aired live on ESPN2's "Friday Night Fights" featured Star Boxing's top welterweight contenders Delvin Rodriguez defending his USBA welterweight championship against Shamone "The Truth" Alvarez. At stake was not only the USBA welterweight title, but also the number two ranking in the IBF world ratings. Alvarez started fast, charging right at the defending champion Rodriguez while Rodriguez looked to establish his jab and box from the outside. A straight left hand briefly staggered Rodriguez midway through the first round but that seemed to only wake up Rodriguez as he began connecting with his right hand from the outside. The middle rounds saw each fighter land telling blows, rocking each other on more than one occasion. Every time it seemed as though Rodriguez would begin to develop a steady rhythm, Alvarez would land a big left hand from his southpaw stance. As the rounds progressed on, Rodriguez seemed to be in control landing the harder punches from the outside, while Alvarez looked to close the distance with wide hooks, and straight lefts. In the 11th round a straight right hand from Rodriguez dropped Alvarez but Alvarez seemed to be more stunned then actually hurt and fought back hard the rest of the round. In the twelfth round Rodriguez stunned Alvarez, and went in for the kill throwing everything he had at Alvarez. With Rodriguez opening up Alvarez threw a perfect counter that rocked Rodriguez. With both fighters right eyes closing, they traded in the center of the ring until the final bell sounded. After twelve grueling rounds, Rodriguez was awarded a close unanimous decision improving his record to, 24-2-2 (14), while Alvarez dropped to, 20-2 (11). In the co-feature bout of the evening, Star Boxing's 19-year-old welterweight phenom Raymond "Tito" Serrano took on once beaten "Smokin" Jay Krupp in a six round welterweight contest. The first round started out quick with both fighters firing shots. A huge overhand right sent Krupp down hard, but Krupp was able to beat the count. The round ended with each fighter standing toe-to-toe firing shots. Round two started where round two left off with both Serrano and Krupp trading at any chance they could. Serrano seemed to be the busier of the fighter, and closed the round strong landing a big left hook. 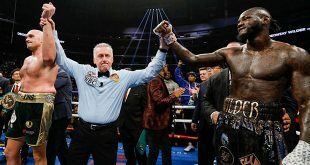 These heavy exchanges became a common theme for the rest of the fight and after six hard fought entertaining rounds, Serrano was awarded a well-deserved unanimous decision. With the victory Serrano improves his record to, 9-0 (5), while Krupp drops to 12-2 (5). In the first televised bout of the evening 2007 amateur world champion and 2008 U.S. Olympian Demetrius "Boo Boo" Andrade, 3-0 (3) needed less than one round to completely annihilate Tom Joseph, 4-2-1 (0), in his ESPN2 "Friday Night Fights" debut. 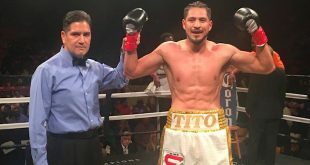 Andrade, who is co-promoted by Joe DeGuardia's Star Boxing and Art Pelullo's Banner Promotions, showed why many considered him to be the top amateur prospect to come out of the Olympics, as he came out firing blistering combinations to both the head and body of his opponent. Andrade showed tremendous hand speed, seemingly landing every meaningful shot he threw. Joseph showed heart by hanging tough but Andrade was simply too much. With Joseph absorbing heavy punishment the referee called a halt to the contest at 1:53.